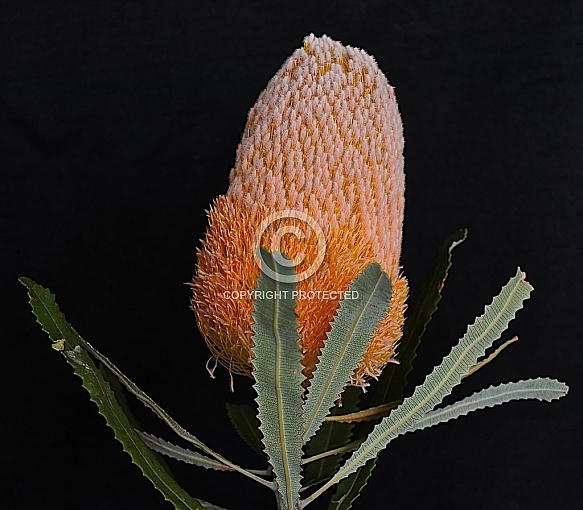 Description: In nature this Western Australian species usually forms a rounded bush up to 4 m (13 ft) high. Under cultivation, it is rare to see specimens larger than 2 m - 3 m. Bright orange acorn-shaped flower heads open from silvery grey buds during late summer to autumn and may be 12 cm long and up to 10 cm wide when fully open. A beautiful cut flower, both fresh and dried, it is a popular picking species in South Australia and Hawaii. Well-drained, lighter soils are preferred by this species, and ideally dry summers and winter rainfall. Light frost is tolerated, and a sunny position is required. Prune lightly after flowering.